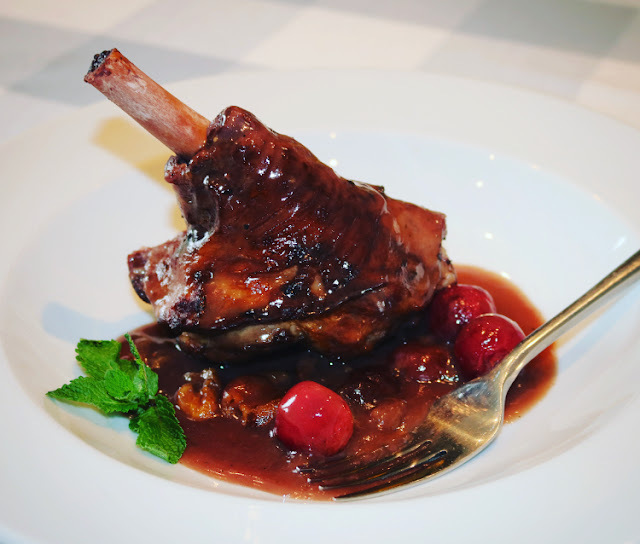 Heavenly tender lamb shanks with a Jerte Picota Cherry glaze, this dish is truly out of this world! 2. In a large bowl mix together the flour, salt, pepper and cumin, add the lamb shanks one by one dusting each with the flour mixture. 3. Add the oil into a large lidded oven-proof casserole dish and place over a medium heat, now brown the shanks. 4. Pour the wine, stock and cherries into the casserole and bring to the boil. Cover with the lid and place in the oven for 2 hours or until the meat is very tender. Remove the lid and cook for a further 30 minutes uncovered. 5. Place the lamb shanks onto a plate and wrap with foil to keep warm. Pour the sauce through a sieve and set aside the cherries. 6. Put the cornflour in a bowl and mix in 2 tbsp of cold water. Pour the sauce into a large pan and whisk in the cornflour paste. Bring to a simmer and continue whisking for a further 10-15 minutes until the sauce thickens, season to taste and return the cherries. 7. Place a lamb shank on each plate and pour over the Jerte Picota cherry sauce and cherries. Serve with buttery mash & seasonal vegetables, rice or cous cous. Enjoy!